Meet the lovely Ms. Jennifer Wofford, The Living Room's artist-in-residence for the month of June 2006. 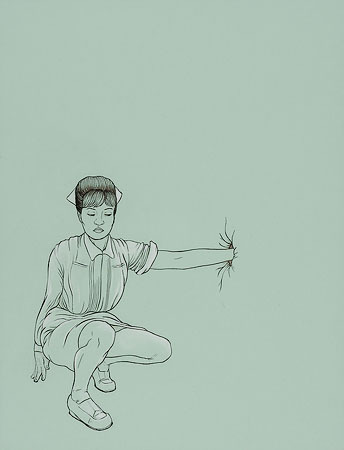 Ms. Wofford, a Filipino-American artist based in Oakland, California. She is a graduate of the San Francisco Art Institute and is currently finishing her Masters in Fine Arts at the University of California, Berkeley. She primarily works in video and performance media and explores issues concerning globalization, perception, and identity. Her works can be seen as humorous, irreverent but always provocative. She has also been know to create lovely line drawings every now and then, drawings just like the one pictured below. It's Part of her "Nurse" series which will open at the Future Prospects art space in Marikina Shoe Expo. 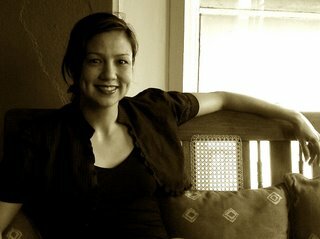 She is also part of the radical San Francisco based performance art trio, Mail Order Brides (MOB). This is her Nth time to the Philippines and looks forward to creating stronger ties between artists in the West Coast of the United States and Manila. Mabuhay ka, Miz Jenniper. Join Ms. Jennifer Wofford and I for a salon style night of artspeak and sunset boulevard views. Ms. Wofford will screen her video work, "Motel Cucaracha" and and show some collaborative works done with Mail Order Brides before beginning the artist's talk. So come on over again to the Living Room next Saturday. The conversations will be artsy, the nuts will be salty, and the shots of Finlandia vodka will be free while supply lasts. There might even be some beer.